For any Software Company that follows agile development methodology, it is a well known process to run standup meetings for the teams. 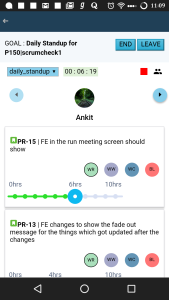 Daily standup of Scrum in nutshell is a short status meeting, for continuous information sharing, and a quick interaction among teams to identify the need for resolving blocked issues. Apart from the above it also works quite well to build team-commitment and bonding. Is there anything blocking the progress of current tasks. Blocking agent can be anything from another task, required resource, design decision, etc. Teams try to focus their priorities such that these blockages are immediately addressed. 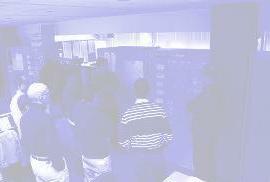 At Wizergos we have a team composing of Front End Developers, Back End Application developers who attend daily standup. For tracking projects we use JIRA where the Issues(stories) are created for each work item, sprints are planned and there is a 2 week sprint running through the backlog of stories. Human memory is funny, some people remember hell lot of things, and go into details of what they did, some are crisp, editing out lot of things. Scrum master had to painfully note down each of these updates(as his job was also to update JIRA) in his notebook which was torn and dilapidated!! ScrumMaster’s job was also to setup follow up meetings for the people who are blocked, open ActionItems for some of the blocked items in some cases (Eg: Devops needs to give this machine for the developer etc). The timecheck on the standup was really hard. Then we realized that this whole process can be better with technology and what better place to do it than in our already existing meeting management platform!! So we decided to build an interactive live meeting screen for the standup. Our Focus was on making the updation minimal and automated, so that discussion during the meetings revolves more around resolving issues and dependencies(rather spending time over what I did and will do). Everyone huddles up now as well, but out comes their mobiles from their pocket to land into the Wizergos Standup meeting screen. The Screen is started by the Scrum Master which fetches the current sprint items from JIRA, carefully catalogues the Issues per person along with the previous day’s updates on the items. Other team members can now join the meeting screen, end of which everyone should be looking at the same screen. Scrum master slides through the pages in the screen each of which contains outstanding items in the sprint assigned to a team member. When he says “worked”, member can also say how many hours he has put, which is automatically logged into JIRA against the issue. Some updates are automatically made by the tool if there is a update in JIRA between last and current standup. Once all the Team Members are done with their updates, there is a burndown chart screen showing the team’s accomplishments so-far and how the trend looks against the ideal burndown. This is followed by the summary page, listing minutes, feedback on the meeting etc. Also all along there is a timer on the screen ticking, so that team can monitor if they are overshooting. After the meeting is over, the tool sends out automatic minutes notification to all the members of the project and stakeholders. 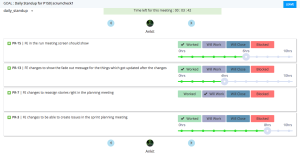 The Scrum Master also gets notifications regarding blocked items on which he can choose to setup follow up meetings (Where the context, attendees for the meeting is pre-filled by the tool all he needs is a click!!) or create actionitems. That is all about standup at Wizergos, will try to follow up this blog with our Sprint planning and Retrospective meetings.